The majority of people want to be more involved in decisions which affect their communities and would like more opportunities to help their neighbours, according to survey results commissioned by the charity Local Trust released today (Wednesday 3 June). three in five (61%) would like to be given the opportunity to help decide how money from funders is spent. The findings show that residents have a strong desire to be given more of a say in decisions affecting their community. The results show the potential for creating more opportunities for residents to be involved in helping their communities and in harnessing the skills and enthusiasm of residents to create positive change based on what is most needed. Local Trust manages Big Local, a programme running in 150 communities over 15 years, providing residents in each community with at least £1 million alongside support and other funding to enable them to lead change in their area. The survey was commissioned to help build a better public understanding of people’s attitudes towards helping in their community and possible incentives for doing so. 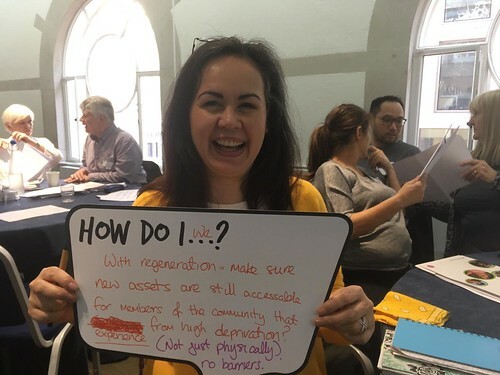 It coincides with a roundtable discussion at the Royal Society of Arts (RSA) being hosted by Local Trust during Volunteers’ Week, exploring new ways in which residents can be supported to transform their communities for the better. Today’s new findings highlight people’s desire to help those living around them, with almost two-thirds (63%) willing to help their neighbours and community[vii] if given the opportunity. A summary of the RSA discussion will be published on the Local Trust website: www.localtrust.knightstudiosdevelopment.com. Attendees represent a cross-section of government, academic, charity and voluntary sectors. Local Trust is a unique organisation supporting resident and community led solutions to create lasting change throughout England. We use a community development approach to resident and community led regeneration of areas. We believe that those who make up the community know best what’s needed and are the most likely to come up with the solutions to make a lasting positive difference to the places where they live, work and socialise. We also believe that we can help them to make that happen, working with a range of partners nationally and locally. We are the corporate trustee of Big Local Trust, managing the expendable endowment from the Big Lottery Fund and the Big Local programme. Big Local is an exciting opportunity for residents in 150 areas around England to receive funding and support over 15 years to make a massive and lasting positive difference to their communities. The trust deed that governs Big Local Trust requires spend of £220m by 13 February 2027. Big Local targets areas that may not have been successful in gaining funding and resources in the past. Each Big Local area is receiving at least £1 million over at least 15 years, along with support, training, and networking opportunities, to help residents develop plans to improve their area and to enable them to find solutions that work for their community. The Big Lottery Fund supports the aspirations of people who want to make life better for their communities across the UK. It is responsible for giving out 40% of the money raised by the National Lottery and invests over £650 million a year in projects big and small in health, education, environment and charitable purposes. Since June 2004 it has awarded over £6.5 billion to projects that make a difference to people and communities in need, from early years intervention to commemorative travel funding for World War Two veterans. IVR is a specialist research and consultancy agency on volunteering with more than two decades’ experience as a leading provider of research on volunteering policy and practice (www.ivr.org.uk). Since 2013 it has been a part of NCVO. [i] Populus survey carried out with 2000 GB adults between 20 – 22 May 2015.